Since my only two pets at 70 were Wolf and Wind Serpent I knew I had to go out and find something else for arena. I started to think my Wolf might actually be viable in 2v2 with my MS Warrior burst team, but when I realized Furious Howl doesn’t stack with Battle Shout it was back to my original plan. I had been considering Hyena for Tendon Rip, Nether Ray for Nether Shock, and then Serpent for Poison Spit. After further thought, I narrowed my choices to pets within the Cunning family because I like that talent tree better for PvP. The Hyena’s skill also seemed less useful than a stun. A slow is nice, but casters can still nuke you, Warriors can still charge, and healers can still heal when slowed. Plus, we have Wing Clip, Concussive Shot and Frost Trap which typically can handle the slowing duties. Nether Shock and Poison Spit are great vs casters but they won’t do as much good vs physical dps classes. I decided a pet that can stun its target is the way to go. Stun is effective against all classes. This left me with two viable choices: Ravager or Bat. At first glance the Ravager appears to win hands down. Ravage has a 40 second cooldown and more damage compared to the Bat’s 1 minute cooldown on Sonic Blast. However, Sonic Blast has two advantages over Ravage despite the longer cooldown and the reduced damage. What are they you ask? Well, I’ll tell ya. Sonic Blast is Nature Damage, meaning it can’t be dodged, blocked, parried, or mitigated by armor. Secondly, and this is the big one… it is a ranged attack. The ranged stun is huge because it means my pet can lock down a mounted target. With 80% increased speed during Dive, the 20yd stun is just enough to stop those pesky casters that like to kite you around on their Amani War Bear at the start of a match. The Ravager has to be within melee range to stun its target, plus it’s a physical attack that can more easily be avoided. Also, if my pet is slowed somehow it can still stun an enemy if they’re within 20yds. Pretty neat huh. Lastly, with Longevity the cooldown is only 42 seconds, and just 14 seconds longer than Ravage. Most importantly though, Bats are just cooler. They glide and have fangs… and are cool. I’m anxious to try him out in rated 2v2. I brought him into an EotS with me earlier tonight and it was pretty great. I’d sick him on a mounted target and watch them hesitate, then try and run off only to be blasted. As soon as that wore off I’d hit Intimidation, followed by an unloading of Mysterious Arrows into their dome. Lots more to talk about, but I’ve spent most my time playing instead of writing. More findings and stories tomorrow perhaps. 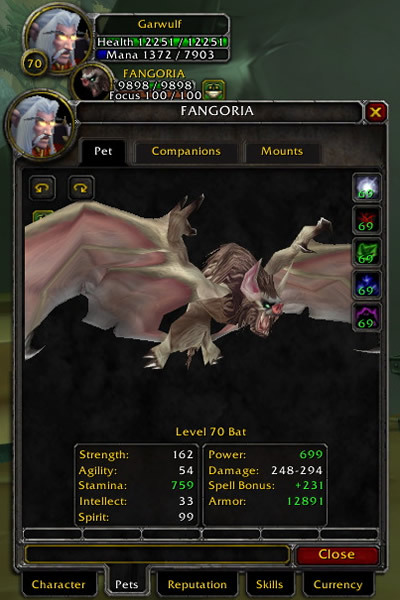 FANGORIA, formerly known as Ressan the Needler, is now level 70 after two nights of bloodshed in the Netherwing Mines. This is a great place to grind pet experience. The mobs are plentiful and they respawn very quickly. Since I’m a skinner, I like to mow down the Ravagers and Flayers for their precious hides. This place is awesome to grind because even the vendor trash will usually yield me around 20G after a sweep. Here are some tools I used to make the leveling process efficient and expedient. … is mine. Check back later to see why I nabbed this pet. Now I just need to get him to 70. At least it’s only 5 levels of grinding now instead of 59. Thanks for that change Blizzard.